Funeral Spray: This is a large flower arrangement that is placed upon an easel. These flowers are usually big in size, so if you are ordering the arrangement online, make sure you allow plenty of time for it to arrive. The flowers arrangement attached to the easel usually represents a special meaning of memory. Inside Casket Flower Bouquet: This is a memorial tribute given to the deceased. These flowers are placed inside the casket for small open casket services. A small clutch, bouquet or garland are most popular for including inside the casket. Wreaths: Wreaths can be a beautiful alternative to a regular funeral flower spray. Flower wreaths can be displayed at almost any area of the funeral service, including the gravesite. Adding personal touches such as ribbons, bows and garland can make the ceremony feel more tranquil. Small flowers or roses can be interweaved amongst the wreath and removed by guests as keepsakes. Funeral Vases: If you are unable to attend the ceremony, sending sympathy flowers can be the next best thing to pass along your condolences and thoughts to the family. It can be a perfect way to show compassion and love without saying a word. Funerals can be a tragic time in the life of any family. It can be emotionally draining and stressful. Attention to detail and personal touches in your flowers are very important. Customizing your sympathy flowers is a great way to show that you truly care. These acknowledgments, especially after the funeral service is over and the routine of daily life is being established again, are greatly appreciated by the recipients. Including personal messages with the flowers is an excellent way of effectively passing on your feelings of condolence. – click here to visit interflora website. Lily and Iris Teardrop Spray – £45 (includes delivery) – Asiatic lilies and carnations are presented with irises, spray carnations and choice foliage to create this lemon and blue teardrop spray. Mixed Flowers in Cellophane £30 (includes delivery) – This sheaf of fresh flowers is simply arranged and presented wrapped and tied with a ribbon. The selection includes cream Asiatic lilies, blue iris, white carnations, yellow spray chrysanthemums, white September flowers and blue statice, hand-tied with leather leaf and palm leaves. Classic Funeral Wreath – £50 (includes delivery) – A classic selection of flowers including irises, carnations and spray chrysanthemums nestled into this traditional circular wreath. Classic Funeral Posy – £45 (includes delivery) – A classic selection including large-headed roses, freesias, lisianthus and spray chrysanthemums presented in a posy design. Classic Funeral Sheaf – £45 (includes delivery) – The soft blue shades of iris are complemented by Oriental liles, large-headed roses and lisianthus in this classic sheaf, which is tied together with a cream ribbon. White Tribute Wreath – £100 (includes delivery) – Pure white roses, Asiatic lilies, carnations and spray chrysanthemums are beautifully arranged to form an elegant wreath accented wth lush and vibrant greens. Displayed on a wire easel, this stunning tribute is a wonderful symbol of eternal life. If someone you know if having health-related issues or is in the hospital, sending flowers is also an excellent way of saying get well soon. Sending flowers can be a unsuspecting boost of happiness for the recipient, no matter what condition they are in. It is important to keep in mind the personality type of your recipient. While some people like calm, soothing colors in their flowers, others may enjoy bright, vibrant colors in their arrangements or bouquets. Since emotions during this time can be sensitive, taking the time to send flowers to a loved one can be effective in establishing messages of support and love. Give the gift of love, life and beauty to express your true feelings for the illness or loss of someone special. Funeral flowers in the form of bouquets and baskets are given grieving families who have lost a member. This symbolizes your support for the family in times of need. When you hear that a person, who you knew, has passed away, your first reaction would be to visit the grieving family instantly, be at their side, and comfort them. However, due to some reason or the other, it may not be possible for you to be physically present with them at that time. May be you live too far away and cannot travel to that place. However, you can express your heartfelt condolences by sending funeral flowers. Offering funeral flowers to the mourning family in respect of the person who passed away is a general practice. It is true that you cannot take away the sorrow with your flowers, but the gift can bring a hint of happiness to the grieving family. You can opt for cheap flowers since you will be sending them through post. They do not require being expensive. You can find cheap funeral flowers in a number of online stores. Buying through online stores will help you save money and they are the best places to get cheap flowers. The prices are reasonable for sympathy flowers and you will notice that it is easy to order them. Superb value traditional floral tributes like funeral wreaths, sprays, sheafs, posies and cushions prepared by SerenataFlowers.com specialist in-house florists. In case of sending funeral flowers, you need to follow a particular etiquette. You cannot choose any kind of arrangement. Many cemeteries and funeral homes have certain rules regarding glass containers. Thus even if you like a beautiful lily in a glass vase, it would not be a good idea to gift it. If you wish to send sympathy flowers as a group then your choice will become more diverse. You will have good room for more selection. You can opt for larger flower arrangements. While making the selection, make sure that the choice is a general. Everyone should give his or her consent for the same gift. For the flowers,choose a big card that has enough space to include all your names. You should always add your contact name and address on the card. It is completely acceptable to send funeral flowers to the grieving family’s home. As it is the time to show your sympathy, you can send your flowers directly to their home. That will give it a more personal feel. If you want to know the correct time for sending funeral flowers then you should know there is not proper time. You should send funeral flowers as soon as you hear the sad news. Express your deepest condolences with superb value traditional floral tributes like funeral wreaths, sprays, sheafs, posies and cushions prepared by SerenataFlowers.com specialist in-house florists. 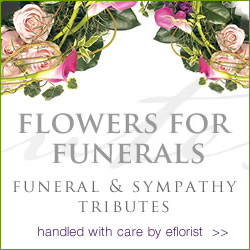 With SerenataFlowers.com you can arrange delivery of funeral flowers direct to funeral homes with their next day courier delivery nationwide in the UK. “Easy and fast online transaction from the choosing of the beautiful flowers to the delivery. I ordered two bouquets of flowers within the week, one for my mother’s birthday & another for a funeral, going to north and south London destinations. Both arrived on time as stated within the time slots requested & were presented exactly as per the website photos. When someone says, “This place smells like a funeral home” chances are there is a lily nearby. This is often considered the go-to funeral flower and there’s significant meaning behind this strongly aromatic blossom. Lilies suggest that the soul of the deceased has returned to a peaceful state of innocence. Christians think this flower symbolizes purity, virginity, and the radiance of the soul. It’s believed that the Virgin Mary’s tomb was covered in this flower. Similar to the flower, the peace lily plant symbolizes innocence and rebirth of the departed’s soul from the complex physical world to a greater place. This is what I usually send to people I know who are grieving. I love how this plant will last for a while in the person’s home of office. Just like lilies, roses are a very common and appropriate funeral flower, and each color rose has a slightly different connotation. White roses are the ultimate symbol of spirituality, purity, and innocence. At a funeral, the classic deep red rose evokes love and grief. The yellow rose is often given by friends to show their bond. The rarer dark pink roses are used to express thankfulness to the deceased. Roses can be mixed in with other flowers or uses in a casket spray, standing spray, or wreath. Orchid plants make particularly special gifts. Unlike orchids in an arrangement, these last longer in the home or office. Unlike other flowers, the meaning behind chrysanthemums varies globally. In America and Europe, the meanings focus on sympathy and honor. The color plays a role in the meaning as well. Red symbolizes love, while white symbolizes innocence. In Asia, chrysanthemums symbolize rebirth and are more often given at baby showers than funerals. Carnations are often used in funeral wreaths and standing sprays. As with other flowers, each of the colors has its own meaning. The red shows affection and the white tends to symbolize innocence. For Catholic and many other Christian funerals, pink carnations might be a good choice since it’s believed they were created from the Virgin Mary’s tears. Talented florist use carnations to create beautiful arrangements replicating sports logos, favorite activities and other personalized tributes. These are mostly added into an arrangement of assorted flowers. There are a variety of thoughts behind the meaning, ranging from “you’re included in my prayers” to deep anguish. Some believe this flower symbolizes sports, games, and rashness so be careful not to insult! The meaning behind this flower is not as well-known as the others, but many believe it symbolizes true heartfelt emotions. As with the peace lily, the plant version of this flower will always last longer than the cut arrangement. Send Sympathy Flowers and Express Your Deepest Condolences. On such a sad occasion, it is important that you let your relative or friend know that you are thinking of them and that they have your love and support.